Club Car President, Mark Wagner, inside the New 6 Passenger Onward. If you’ve ever been around golf at all, the Club Car brand means something to you. 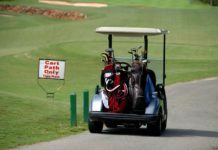 Whether it is the golf car you use at your favorite course or you’re the proud owner to one of its many models, the name has come to represent one of the best ways to play a round or cruise the neighborhood. Rain or shine, hilly or flat, the carts are always ready to give you a good ride over 18 holes. It is a legacy of quality since Club Car began in 1958. Development of digital technology is one area where Club Car has shown signs of outpacing the competition. There are more features than anyone ever imagined 60 years ago, all designed to help the users, owners and authorized dealers enjoy a better in-car experience. You’ll have a better understanding of the current and future innovations when you read the Q&A that follows. It is interesting, as well, that Club Car represents more than just golf. The company also makes small vehicles for use in the commercial and industrial market (Small-Oriented Task Vehicles). You’ll find various Club Car vehicles at factories, warehouses, hospitals and college campuses all across the world. Additionally, golf markets have been steadily evolving. They used to manufacture the vehicles for simply enjoying a round of golf, but emerging technology has created a sub-market of golfers who want to enjoy entertainment and information while playing. This has driven to the development of the Visage system with which we discussed in another recent article. There are more details in the Q&A that follows, direct from Club Car’s President, Mark Wagner. He acknowledges that technology and keeping an eye on what individual market segments need will keep the growth of golf headed in a positive direction. In fact, the implementation of technology could attract more millennials, the fastest growing demographic of the U.S. population because of their affinity for technology and its use. GCR: Well, Mark, we really appreciate you taking the time to meet with us today. 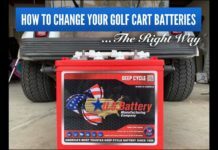 Club Car has been around since 1958 and what is really impressive is the reputation of the brand, your dealer network, and the growth Club Car has seen over the years. How has the introduction of the Baby Boomer generation affected Club Car’s strategy and overall position in the market? Mark Wagner: I think all of the generational demographics are important not only in golf but in the consumer and utility market segments that we also serve. If you look closely at the Baby Boomer generation inside of golf, there are traditionalists, and there are progressives or more entertainment based golfers which impact our strategy and evolution of product features. This changing demographic has led us to introduce Tempo Connect and the Shark experience, where we are bringing entertainment into the cars. 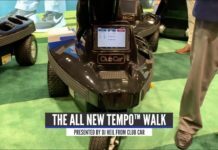 It’s continued with Tempo Walk where golfers can walk a course with an autonomous hands-free caddie at their side. It’s adding some fun to the game and enhancing the experience. As for the Generation X – the 40 something’s – that have young families, we’re seeing increased interest in consumer vehicles which are becoming part of a new neighborhood lifestyle experience. So it’s essential we stay attuned to customers varying interests. And because we can offer many options, we are passing that along to customers, giving them the flexibility and freedom to design their car their way. GCR: In a follow up to that, your background indicates you’ve had to provide strategy on the different sectors of Trane and other industries as well. 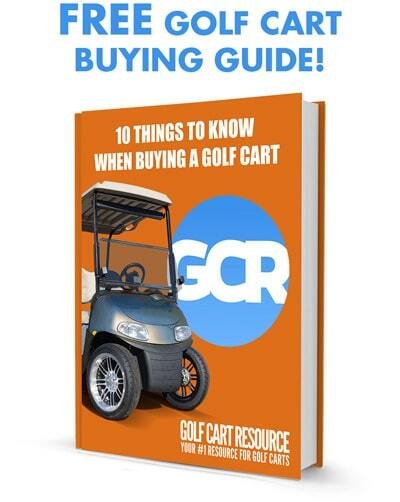 Now that you’re with Club Car, there are a variety of industries you’re going after – the fleet golf, the retail user, the industrial, and commercial market itself. With that in mind, how have you approached those differing industries? 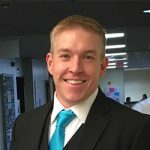 Mark Wagner: The business to business side is where I came from. The distribution channels are very similar, but with different products. So we identify best practices from each of the business units and apply them to other businesses. And with Club Car as a manufacturer and a distributor, we can take certain things from each. We can take some of the cool aesthetics from our consumer offerings and introduce them into golf. Like custom seats and some of those things. And vice versa. The connectivity that’s in golf, our Visage connectivity platform, we can think about ways to incorporate this into our consumer vehicles with mapping and entertainment and beyond. We’re looking outside our four walls to identify new ways to apply our technology and best practices across all aspects of our business and offerings. GCR: So to clarify, Visage is going to be available to the general public? Mark Wagner: The technology that we have on the golf course now, we can now think about having anywhere. Neighborhoods. College campuses. Visage is the brand name for the screen and the technology we have for the communications platform we provide through our technology arm, GPSI. When we bring this technology to the consumer and utility sector, the screen may change and resemble more what you see in traditional automobiles. 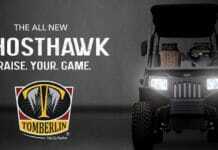 With utility vehicles, it might be more usage related. We want to provide more practical visuals of what operators want and need to see to run their business. The operator may only see a screen, but what they have is a centralized place for them to monitor their fleet so they know where they are and what they are doing. We’ve had customers tell us sometimes [without Visage] it takes them hours at night to figure out the location of the vehicle. 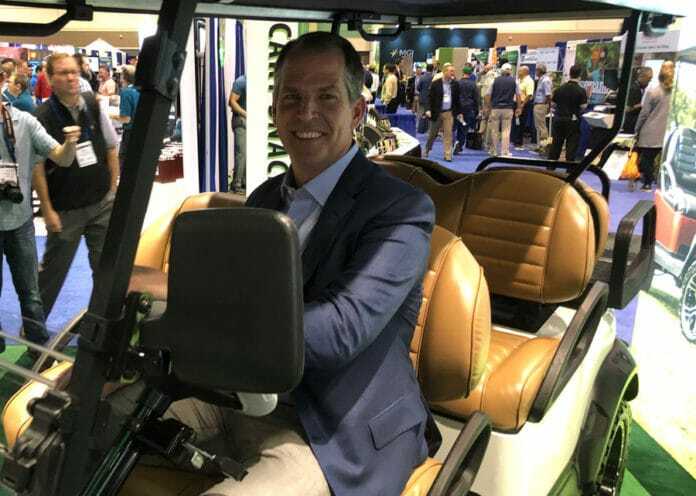 It’s amazing to me we had connectivity in golf cars for over a decade, but we haven’t seen that in utility yet. GCR: No, not at all. It’s non-existent. Mark Wagner: And the reason is the infrastructure, which we now have—and it’s just about applying it. In regards to golf courses, probably the most significant piece was over the last couple of years, the management of the system from the clubs has dramatically increased. If you see some of the visuals, they can see where those cars are, they can see the operation of them, they can see when it’s wet, and they want to steer golfers to golf cart path only. They can control them. If they go off somewhere they’re not supposed to be, we slow them down and we send messages. So, think about that when you’re in a neighborhood, and you set it up with your kids, “Hey, I want you on these three streets. Do not cross that intersection.” Well, the vehicle, with Visage, the technology could allow you to set up active zones. GCR: That sounds fantastic. So let’s shift gears and talk about the prized horse, the Onward. It’s been out for a while now. What do you see as the biggest contributors to the Onward’s success? I think where we go now, it’s the consumer expectation and online buying, and that dramatically changes with the number of accessories and the options we offer. Now, there are thousands of options that need to come down the production line, and think of the consumer expectation – can I get that tomorrow? It takes a combination of things to deliver that expectation with a focus on quality. GCR: Wow, this has been great. Thank you. Just one last question – You kind of touched on it already, however, how has the digital era affected Club Car [as well as the industry as a whole] in your eyes? Mark Wagner: I think it’s the expectation. Whether it’s a golf worker or even a utility worker or a consumer the expectation of technology and the entertainment and valued features. Then, it’s how customers want to interact with us online. We are now focused on the next generation. How we’re using the feedback we’re getting from digital tools to make more informed decisions. I think the beauty of a 60-year-old company is a lot of the vehicles’ insides are legacy. With our new lithium golf car, there’s a full communication system, and it looks like what you would expect an automobile to look like. That gives you a lot of features and serviceability. I think digitally inside the car, digitally of how we interact with the car, is where we’re trying to make sure we’re moving in the right direction. 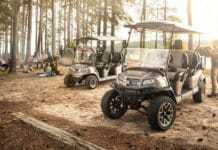 For more information on everything Club Car is up to, visit ClubCar.com.